Natural Phenomena Set No. 1 is one of four sets of pieces for digital piano based on extramusical ideas exploring various natural phenomena ranging from subjects associated with astronomy and physics, to evolutionary biology, prehistory, and the brain. The music is intended to provoke the listener to imagine events in the world as a series of discrete patterns, unique and independent, that occur sequentially and continuously in a variety of forms, at different times, and at different orders of magnitude and scale. The title of the first piece, Sonoluminescence, refers to vibrating air bubbles trapped in a sound field which emit a blinking light as they expand and contract. These particles represent a true interaction of light and sound at an infinitesimal scale. The Dancing Venus of Galgenberg is a small figurine of a woman in an animated pose. This object is one of the first stone sculptures made by early humans. It was crafted 30, 000 years ago at a Paleolithic site near Krems, Austria. Other titles are self-evident. The music was generated by a computer from a set of microprograms which contain instructions for realizing the music. The instructions combine the simplest elements of musical texture (pitch, dynamics, duration, speed, rhythm, articulation, etc.) with basic structural elements (continuity, repetition, variation, and chord structures which are derived from the melodic flow of the music). Some random variability is introduced in the program to provide structural coherence. The program outputs the musical information in the form of MIDI data which controls the digital piano. 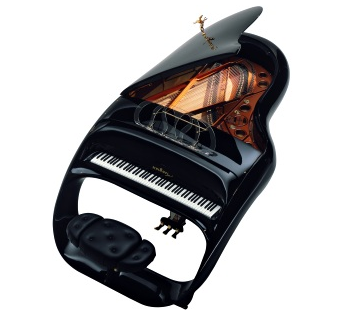 The digital piano is a commercially available Bosendorfer sample which has been modified by the composer to accommodate both aesthetic concerns and MIDI programming challenges. Although one cannot help but make the comparison, the digital piano is not intended to imitate or act as a substitute for a standard concert instrument. Rather it has been designed to function as a true digital instrument, possessing it’s own unique qualities and character. ‘…The Prelude to Capriccio for a sextet of strings is not only the overture to Richard Strauss’s final opera, but also the subject of the opening scene. Capriccio is Strauss’s opera about opera, dealing with the dichotomy of words versus music. The curtain rises and the string sextet is still heard as if coming from another room. On stage Flamand, its composer (who represents music) and the poet Olivier (who obviously represents words) are eager to see the Countess’s reaction to the piece. Richard Strauss called Capriccio a ‘conversation piece for music,’ an unconventional but fairly apt description. ‘…As a former editor of Wagner News, the contrast between the reputations of Strauss and Wagner in terms of anti-Semitism often strikes me as curious: Wagner is still vilified for his anti-Semitic views and his art is often characterised as being a progenitor of National Socialism, despite the fact he died in 1883. Wagner’s work remains banned in Israel to this day for instance, whilst Strauss’s music (after a shorter period of disfavour) is now almost universally accepted there. What is odd about this, is that from 1933 onwards Richard Strauss was an official of the Third Reich. It is true of course that much controversy remains about his role in Germany after the Nazis came to power: some say that Strauss was consistently apolitical, that he considered most of the powerful Nazis to be philistines, that he never cooperated with the Nazis completely and that it was the fact that his daughter-in-law was Jewish (and his grandchildren part-Jewish) which made him keep his criticisms to himself. The sounds of various computers, peripheral devices, and digital phones were mixed with samples of computer music, including several short traces from the Columbia/Princeton early computer music recordings, and a variety of original electronic sounds. There are eight tracks altogether. 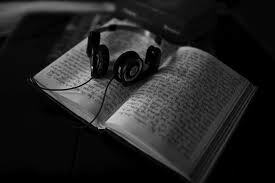 The sounds on each track were arranged independently of one another and of other tracks, and separated by silences. Two tracks of music were sampled from the standard recital repertory: Dvorak’s familiar Humoresque for violin and piano, and Rossini’s duet for two scratching, pawing (meowing) sopranos. Each of these tracks was separated into short musical segments, naturally bounded by silences. The segments were then recombined independently of one another, and of the other tracks, and separated by varied durations of silence. Another five tracks were devoted to classic cartoon sound effects along with electronic sounds. The structure of the music is designed to provide an animated ‘cartoon’ experience. Like many artists, Robert Schumann had a rich inner life. Especially in his early and late spare piano pieces, do we find a nearly heartbreaking vulnerability in his music. The early Night Pieces, Opus 23, were, in fact, inspired by the death of his older brother. The final piece in the set, No. 4 (Rundgesang mit Solostimmen), is one of the most intimate, sublime jewels of 19th century romantic piano music. George Antheil and Olga Rudge first performed the Violin Sonata No. 1 in 1923 at the Salle du Conservatoire in Paris. The sonata was commissioned by poet Ezra Pound and it’s performance turned the composer into an instant celebrity. In Paris, Antheil was friends with most of the famous artists of the time. When presenting recitals, he would carry a loaded pistol onto the stage and place it in plain sight on the piano. The implication was clear. Antheil was soon to be known as “the bad boy of music.”, which would later become the title of his autobiography. Besides his musical output, Antheil also contributed popular essays to Esquire and published books on subjects ranging from mystery and criminology to military strategy. He also famously designed and patented a World War II submarine torpedo with Hollywood actress Hedy Lamarr. In 1926, Antheil collaborated with abstract filmmaker Fernand Leger to create his infamous Ballet Mechanique. Hedy Lamarr’s U.S. Patent 2292387, issued an 1942 for a ‘secret communication system’.